Heat oven to 400 °F. In a large pot of boiling salted water, cook pasta per package instructions. Make sure noodles are al dente, and not too soft. Drain and return to pot. In a small bowl, mix together the panko and melted butter. Heat 2 tablespoons butter over medium heat in a saucepan. Stir in flour, onion and garlic powder and cook for 1 minute. Season with salt and pepper. Slowly whisk in broth and milk. Add Worcestershire sauce. Cook, stirring constantly, until sauce comes to a boil. Reduce heat and simmer, stirring frequently, until sauce is thickened, about 8 minutes. Stir in the grated cheese. 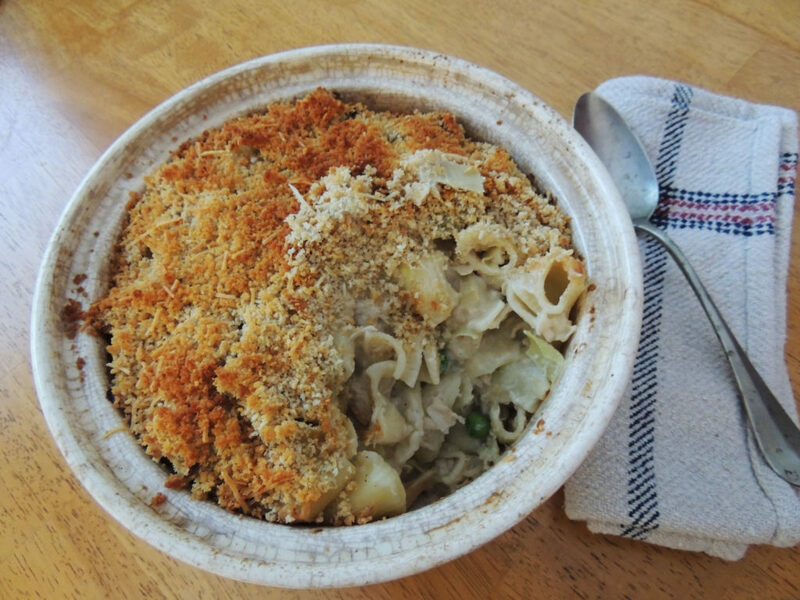 Pour into the cooked noodles along with the tuna, artichoke hearts, and peas. Taste and add more salt and pepper if needed. Transfer tuna mixture to a greased 2 quart baking dish and sprinkle with panko crumb mixture. Bake until heated through and golden, about 35 minutes.